Years before I had this autograph website, I had my own site, which was all about me and my interests. A complete, alphabetical text list of my autographs was also on that site, as well as my contact information (e-mail address and instant messenger usernames). In the spring of 2001, I'm at my computer and I get an instant message from a random person that says, "you don't have my autograph." Not knowing who this person was, I asked for his name. 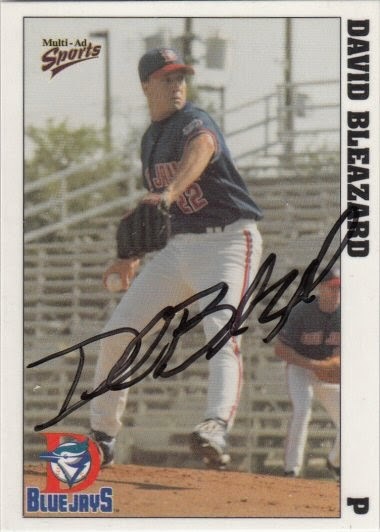 He then tells me he's David Bleazard, a Minor League pitcher for the Toronto Blue Jays. I told him that I was planning on going to the complex the upcoming weekend and would have a card for him to sign. Truthfully, I never had a card of David, but I knew a guy who sold Minor League baseball cards, so I quickly ordered one and had it delivered to me just in time for me to meet David that weekend. David signed a 1999 Dunedin Blue Jays Team Set card #6.